This week, New Orleans, LA hosted the North American Association of Computational Linguistics (NAACL) conference, a venue for the latest research on computational approaches to understanding natural language. Google once again had a strong presence, presenting our research on a diverse set of topics, including dialog, summarization, machine translation, and linguistic analysis. In addition to contributing publications, Googlers were also involved as committee members, workshop organizers, panelists and presented one of the conference keynotes. 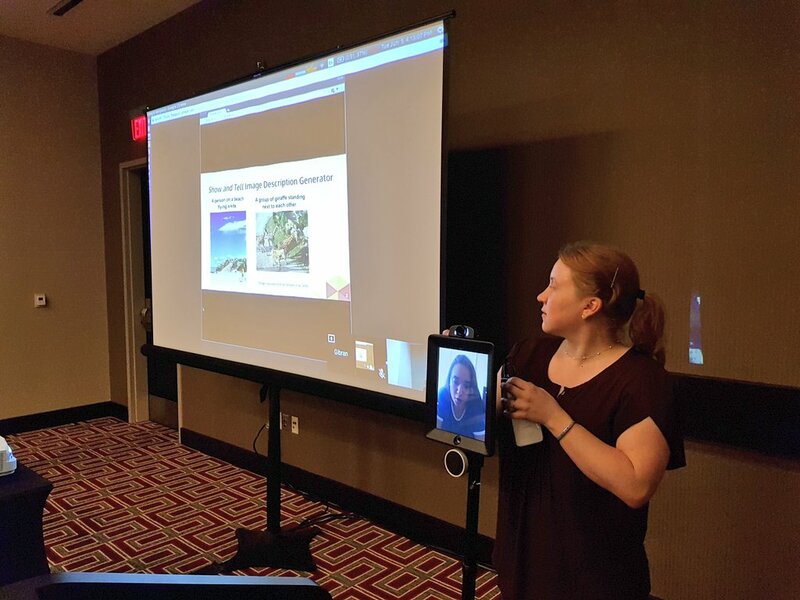 We also provided telepresence robots, which enabled researchers who couldn’t attend in person to present their work remotely at the Widening Natural Language Processing Workshop (WiNLP). Googler Margaret Mitchell and a researcher using our telepresence robots to remotely present their work at the WiNLP workshop. Before the introduction of the BLEU metric, comparing Machine Translation (MT) models required expensive human evaluation. While human evaluation is still the gold standard, the strong correlation of BLEU with human judgment has permitted much faster experiment cycles. BLEU has been a reliable measure of progress, persisting through multiple paradigm shifts in MT. The structured perceptron is a generalization of the classical perceptron to structured prediction problems, where the number of possible “labels” for each input is a very large set, and each label has rich internal structure. Canonical examples are speech recognition, machine translation, and syntactic parsing. The structured perceptron was one of the first algorithms proposed for structured prediction, and has been shown to be effective in spite of its simplicity. This paper is amongst the first works in sentiment analysis and helped define the subfield of sentiment and opinion analysis and review mining. The paper introduced a new way to look at document classification, developed the first solutions to it using supervised machine learning methods, and discussed insights and challenges. This paper also had significant data impact — the movie review dataset has supported much of the early work in this area and is still one of the commonly used benchmark evaluation datasets. If you attended NAACL 2018, we hope that you stopped by the booth to check out some demos, meet our researchers and discuss projects and opportunities at Google that go into solving interesting problems for billions of people. You can learn more about Google research presented at NAACL 2018 below (Googlers highlighted in blue), and visit the Google AI Language Team page.